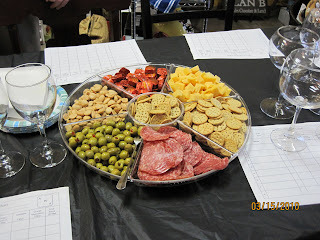 The Wine Lover's Club held it's March meeting at Sociale on Tuesday the 16th. It began on a somber note as we bid a fond but sad farewell to one of our members who passed away rather unexpectedly. He loved French wine, so we toasted with a Bordeaux after a heartfelt tribute to him and what he meant to all of us. As with all meetings, we handled the business end of things first, or in this case, second. We decided on a design to represent our chapter of the American Wine Society going forward, and chose a new e-mail address that reflects our name change. The minutes were read and the treasurer gave her report. I liked all but the first one. The Egruen seemed a little harsh compared to the rest. 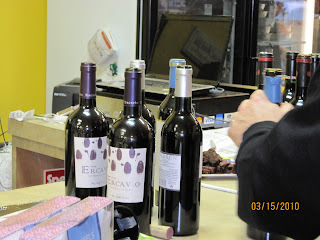 The Ercavio was much smoother and well balanced (my favorite). 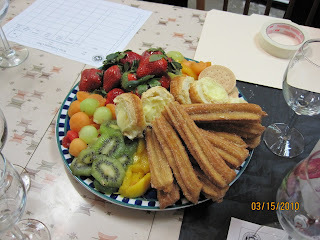 The Venta Mazzaron was much more fruit forward with an almost sweet taste. It was still a dry wine, but the fruit gave it sweetness. The last two were smooth, easy drinking, but less fruity. They all paired well with the food. As you'll see below, we had a lot of different type of food to pair with. Here are the wines being opened for tonight's tasting. Lots of good munchies to go with our wine. One of our newest members prepared a fruit and dessert platter. Doesn't that look pretty? Everyone pitches in to clean up. Meetings are currently held at 7 p.m. on the 3rd Tuesday of each month at Sociale, on Knollwood Street in Winston-Salem. Occasionally we treat ourselves to breakfast out on Saturday's, and this was one of those days. It's usually the Bo, but today we went to a real sit-down restaurant instead and had pancakes. Here's was we did afterward, which leads me to believe there was an ulterior motive involved in the restaurant selection. It seems there was a farm tractor show being held nearby. It was the 2nd Annual Farm Toy Show, and it was held at Windmill Acres Farm on Jasper Lane in Winston-Salem. Trucks lined both sides of the road leading to the exhibition buildings. The property is owned by Phil and Brenda Fishel, who collect antique tractors and farm toys. In the field there were all kinds of tractors, new, old and older, and other kinds of farm equipment. We had heavy rain last night, so we didn't walk through the field to look at them. In the buildings there were displays of model tractors, tractor trailers and other memorabilia, much of which was for sale. There was even a "Show Special". They also had old lawn tractors, similar to one we use to this day. One tractor had a small tank labeled "gasoline for starting only". These actually run on kerosene. And there were toy tractors? And even an old wood stove. It seems there was something for almost everyone. Move over Fred Flintstone. This is actually a pedal tractor. Wanna be a winemaker? Raffaldini Vineyards in Rhonda, NC invites you to come and blend your own red wine each weekend now through December 6. Sessions will be held 1-3 p.m. on Saturday and Sunday. There will be a tasting of several single varietal wines led by owner Jay Raffaldini, and then participants will mix their own blend. Each blend will be tasted by the winery, and the best one will be chosen to be the next Bella Misto blend. The 2007 blend won a gold medal at the Lodi International Wine Competition in Lodi, CA. Cost is $15 per person, and sessions are filling up fast so call 336-853-9463 to make your reservation now. Who knows, you could be the maker of the next Bella Misto. Please see website for directions and more details. There is a lovely little Italian restaurant in Spencer, NC called Pinocchio's. 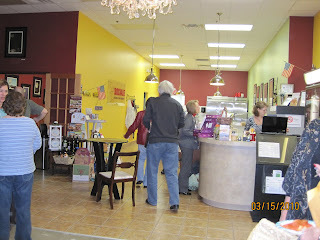 The atmosphere is warm and friendly and the food is delicious. Giuseppe, the chef, is a creative force in the kitchen, and Tracy keeps everything else running smoothly. This year they will be joining Toys for Tots as a donation point. Here is what Tracy said in her weekly e-mail. "It's going to be a particularly rough year for young families to afford Christmas shopping, so Pinocchio's is a donation point for Toys for Tots. Just write a check made payable to Toys for Tots and bring it in when you come to dinner; I will take it, match it 50 cents on the dollar through my book company, and get a whole bunch of Fun Kid Kits to our local kids. Your cancelled check is 100% tax deductible". I hope you can join them for dinner sometime soon. You'll leave with a happy tummy and a warm fuzzy feeling, and no I don't mean from the wine either. So drop off a check, and help make Christmas for the children. Yesterday, I got a call from our good friends, you know the folks from the Rose Garden posts earlier, asking if we'd like to go a corn maze with them and the kids. Of course! It was a beautiful day after the rain moved out - it poured this morning. We followed the directions on the website (this actually took us the long way around but it was short notice and I didn't have time to check the directions against the mapping software) Anyway, we got there and they were already there, and had been swinging on the swings. In addition, there were sandboxes, pole ball games, bean bag toss, water balloon for sling-shotting (probably not a word) and a corn cannon for the kids. There was also a cow train, mostly for kids too, but I did see some very large "kids" on it. We all went on a hayride around the farm, several small lakes and some muddy hills. This was a farm wagon loaded with hay bales pulled by a tractor. It was a $1 extra per person for the ride, but the scenery was gorgeous. I wondered several times if the tractor was going to make it up the muddy hills, and the back end nearly dragged the ground in places. We were seated near the back, so the ride was a little tilted at times. 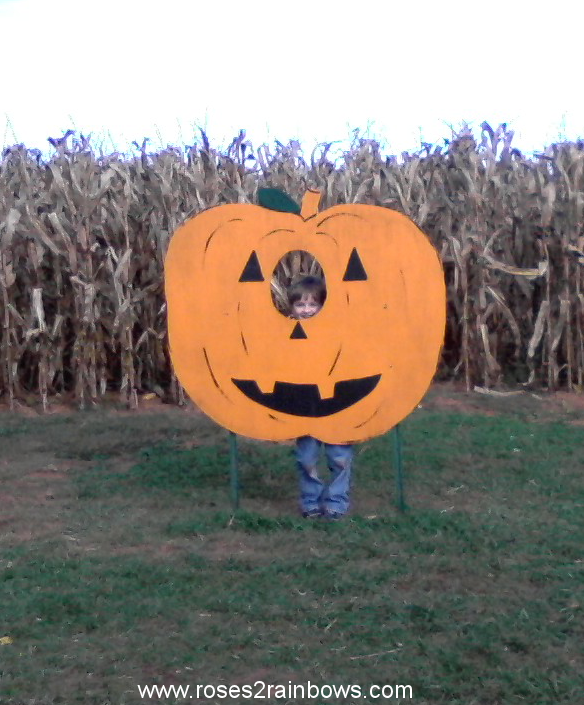 The feature activity was, of course, the corn maze. They said it was 7 acres, and the maze was in the shape of the United States. The paths were wide and maneuvering was not difficult. We were given ariel view maps (see the link below for picture), and there were strategically placed "you are here" signs throughout. The pictures were taken when the corn was green, and now it is quite dried and brown. Nevertheless, it was fun. We joked about trying it in the dark with flashlights. The places closes at dark, though, which is probably good. There are food and beverages available for purchase. The fun all takes place at the 2009 Alpha Acres Corn Maze, in connection with the Winston-Salem Rescue Misson. I believe this was a fund-raising event.